Gary Makes $6K on His First Wholesaling Check! Amber and Sarah Make $6,000 on Their First Check! Kriss Makes $8K in 45 Days by Wholesaling! Troy Makes Almost $30 GRAND on His First Wholesale Deal! Trevor Makes $5,500 on His First Wholesale Deal! Fireman Makes $13,255 in 35 Days with Real Estate! Dave Awakens His Entrepreneurial Spirit with a $2,750 Check! Tina Makes $14,579 Off Her First Deal! Katrina Makes $6,753 on Her First Deal! Talha Makes $10K on His First Deal! Patrick Makes $15,755 on His First Deal! Parker Helps a Family in Need with His First Deal! Carmen Asks for a Refund and Gets a Reality Check! Justin Makes $4,500 on His First Deal! Lehman Makes $7,000 on His First Deal! Danny Makes $10K in Just 34 Days! Zach Makes Over $40K in a Month Wholesaling Houses! Alex Makes $3,400 on His First Check! Amanda Makes $2,500 on Her First Wholesale Deal! Greg Makes $10,500 on a Wholesale Deal! Stephen Makes $1,000 on His First Wholesaling Deal! Kyle Makes $14,600 on His Very First Deal! Malik is On His Way to Freedom With $24,000! 3 Sisters Make $10K On Their First Deal! Tyler Quits His Job to Wholesale Full Time! Sgt. Leo Makes $7,500 From His First Deal!! Monique Makes $21,823 on First Wholesaling Check!! Antrone Makes $1,250 on His First Check!! Eric Makes $3,500 on His First Check!! Priscilla Makes $8,000 on Her First Wholesaling Check!! Evans Gets His First Check For $8,000!! Steve Makes 3 Grand Off His First Wholesaling Deal! Dave Made $10K On His First Check! Jonathan Makes $86,000 PART TIME in Just ONE MONTH!! Luis Makes $90,000 Off Just ONE DEAL!! Ezra & Partner Make $8,000 First Check! David Makes $9,000 in One Month Wholesaling! 21 Year Old Steve Makes $30K On His Very First Deal! Randall Makes $12,000 On His First Check Wholesaling Part Time! Jon Makes $9,000 On His First Wholesale Appointment!! Frank Makes Over $17,000 in Just 3 Months! Paul Gets His First Check For $4,500! Tom Nets $9,695.67 on His Very First Deal! Justin Continues to Flip More Deals! This is Just One of Many That He Has Done! Greg Talks About the “Soft Pass” and How it Has Saved His Business Netting Him $6,500! R.J Discusses His First Deal and How The Flip2Freedom Helped Him Make Over $5,200! Garland a Flip2Freedom Member Makes $4,000 Wholesaling Part Time! David Makes $800 on His First Deal and Learns a Valuable Lesson! Fernando is Closing 2 Deals That Will Net Him $9,600! irtual Wholesaler Mark Van Dyke Gives an Update on How He Rocks Out $250k in His REI Business! Flip2Freedom Member Anthony Shares His 1st Deal He’s Working and How REI Is a Gateway To His Dreams! 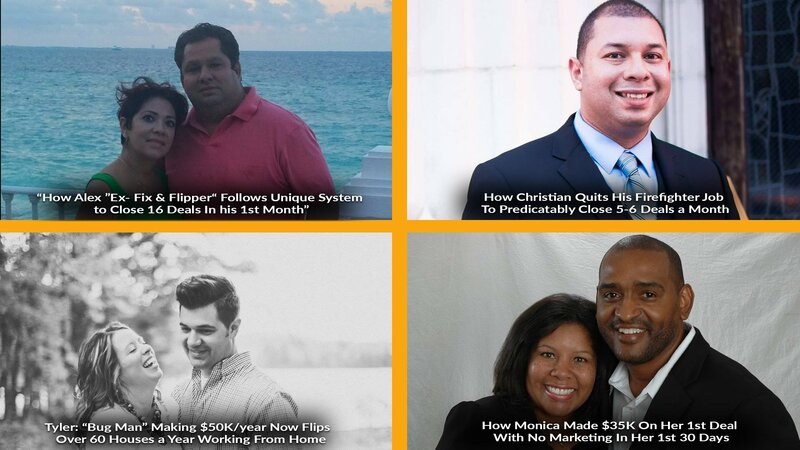 Flip2Freedom Success Story: Josh & Christina Share Their Most Recent Success! Flip2Freedom Success Story: Deshone makes $17,500 on his FIRST deal! Justin Made $17,543 on His First 2 Deals in 2 Days! Daniel & Josh Closed their First Wholesale Deal and Made Over $7,000! New Real Estate Investor Dustin makes $16,162.00 in one week using Flip2Freedom! 2 New Investors Make Over $3,200 on Their First Deal! 2 College Kids w/ No Experience Make $3,500 in 30 days Using No Cash! Marcellus Makes $5,000 in 30 Day Using this “Hush Hush” Tactic! Bryan Makes $7,558.50 on his Very First Flip Using Flip2Freedom! Intermediate Investor Makes Over $7,000 Using Flip2Freedom Strategies! Flip2Freedom member makes $8,292.55 within 7 Days of joining! Brian Makes $10,000 on His Very First Flip! Dorsey Makes $4,675.25 on His 1st Deal! Factory Worker Makes $4,029 only Working 5 Hours! Flip2Freedom Member Juanita Shares How She has Closed 2 Deals and a 3rd One Closing Within a Week! Marshall Shares His Walk of Faith & How The Flip2Freedom Academy Has Helped Him Move Forward! Ronnie Shares His Success After Only Being in The Flip2Freedom Academy For 3 Weeks!